Raise your hand if you need another potato dish this Passover? You too? I knew it wasn’t just me. I mean, there is such a ridiculous amount of potatoes floating around come Passover. And if your family is anything like mine, they’re groaning at the thought of more potatoes. My trick? Change things up a little. Roasted potatoes, baked potatoes, fried potatoes…they only get you so far. So if you’re in need of a new idea, I’ve got one for you. But first, let me explain about Passover recipe testing and the measures of success. There’s a point, I promise. Some of you might disagree, but overall I think we can pretty much agree that there’s a whole different bar for Passover food. What might constitute “good” during the year is probably considered “great” on Passover. But as a recipe developer, that presents a total problem. Y’all are cooking for Passover *now* but I’ve been doing it for months already. And while that bar might be lower for Passover food, nobody cuts you slack for food your prepare during the year. Even if you tell them it’s for Passover. So basically my point of this entire (very long) introduction is to tell you that my family totally has no mercy when it comes to critique of my recipes. And what can I say? This one was tested on them weeks ago, and it got rave reviews. Not rave Passover reviews, but all-year-round, fight-over-the-last-bit kind of rave reviews. And that, my friends, is a successful Passover recipe. Or, as I just established, a successful year round recipe. There’s no reason this shouldn’t be on your dinner table tonight. Or any night. If you don’t eat peels on Passover, scroll down for a no-peel option! Preheat oven to 400. Lightly grease a cookie sheet. Cut the potatoes and sweet potatoes in half and place cut side down on greased cookie sheet. Bake at 400 for 45 minutes. Remove from oven and set aside to cool for a couple of minutes. While the potatoes are baking, sauté the diced onions in olive oil on a low flame. 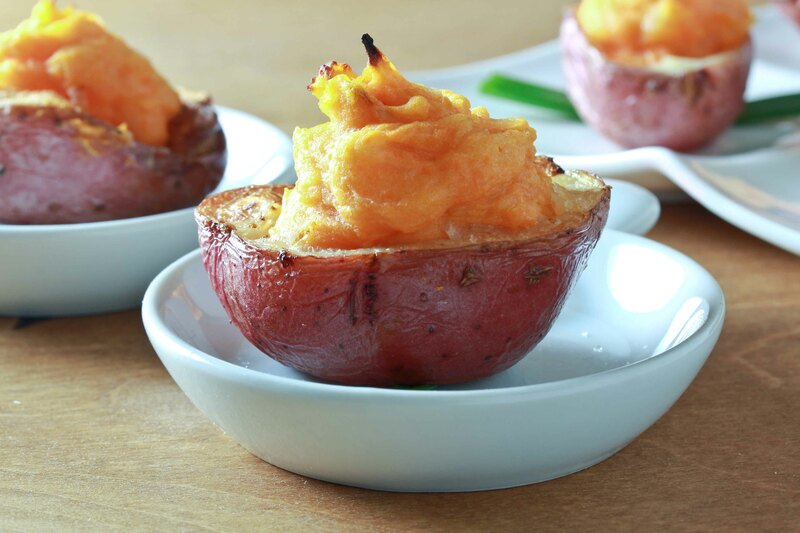 Remove the peels from the sweet potatoes and place the insides in a bowl. Cut the center of the red potatoes out to form a cup. Don’t cut all the way to the peel, or they won’t hold their shape nicely. 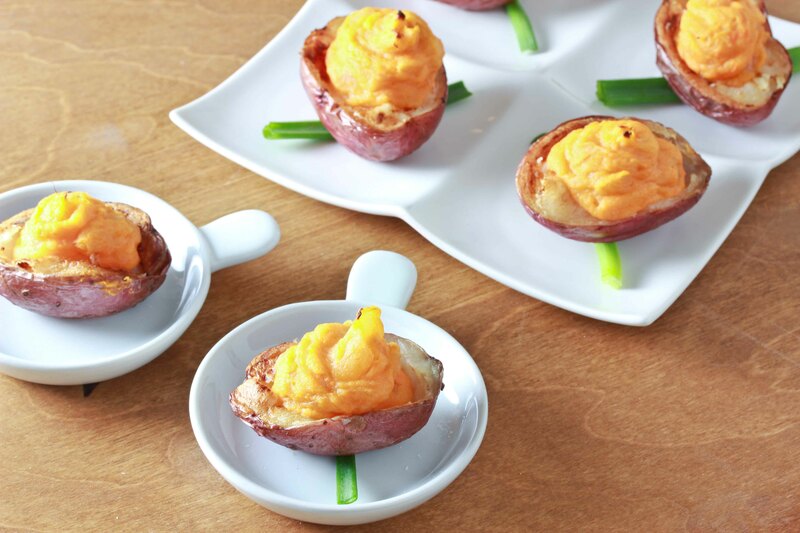 Place the potato centers that you cut out into the bowl with the sweet potatoes. Add the sautéed onions, egg, salt and pepper. Mash the mixture until smooth. Place the potato cups on the tray. Return them to the oven and bake at 400 degrees for an additional 15 minutes. Serve hot. Tip: if you don’t eat peels on Passover, pipe some of the mixture onto a slice of potato- (partially bake it per the directions above) or even straight onto a tray. Bake as directed above. Wow! What an awesome looking recipe! OMG!!!! This is so AUSOME!!! I can’t to try it looks fabulous. What a wonderful idea! Of course, my version would include some dairy products. 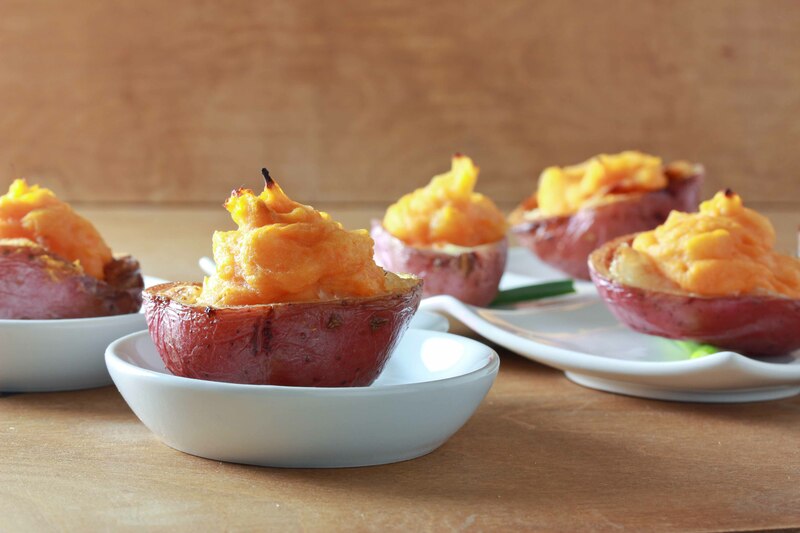 These look lovely and such a great idea to combine red with sweet potatoes. Looks amazing-do you think there is any way to prepare these a day in advance? Or they have to be served immediately? You should be okay making them a bit in advance, just reheat before serving. If baking a day in advane, should they be refrigerated before re-heating in the blech? these were delicious! so original! Is there a way to serve this on shabbos day, or it has to be served immediately after cooked? You can heat it up on top of the blech!